Hidden below the lid are 21 small heart shaped chocolates and a big brown ILU bar, making it a great gift for valentine day. 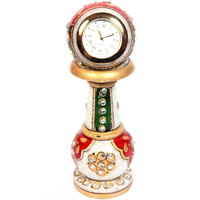 The most adorable aspect of this gift basket is it’s beautifully designed lid which is adorned with pink fabric and white lace around its circular Read More..edge. Hidden below the lid are 21 small heart shaped chocolates and a big brown ILU bar, making it a great gift for valentine day. Show Less.. 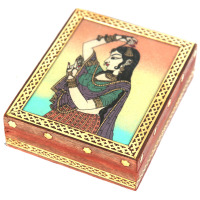 The mesh style adorning the border of the box together with the stone carvings raise the royal and sumptuous look of this rectangular jewellery box. 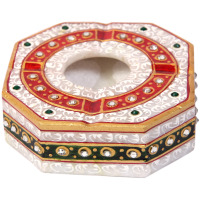 To complete the magnificent look, a similar strip in green runs around the eight sides of this octagonal ash tray. 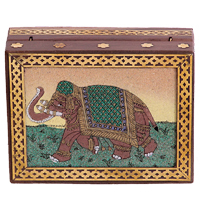 This ancient Rajasthani stone jewellery box is spacious and cushiony with red velvet to stay the jewellery damage free.